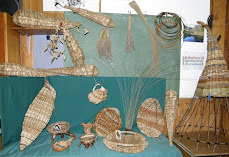 Suitable basketry material from the garden will vary depending on the project however any material that is flexible and can be bent may be suitable. Test out plants flexibility twist and wrap leaves around your finger. If it’s flexible when fresh then it may be pliable when dried .Bend vines and poles to see if they bend the amount required. Try plants at different seasons to test flexibility and what they look like. Some materials are better used fresh and others better when dried and dampened. Some techniques are better with fresh others with dried. Fresh materials will shrink as they dry leaving a loose weave. Some commonly used plants for weavers are most leaves from bulb plants e.g. iris, watsonia, daffodils, Aunt Eliza. , red hot pokers, arum lily, NZ flax, Cordyline, hops. Climbers such as passionfruit, Honeysuckle & jasmine, Kangaroo paw, banana stems, bulrush. Frames and stakes can be made from grapevine, wisteria, willow, fruit tree pruning's, bush sticks and branches, bamboo. Most materials need to be dried, wet and then wrapped in a towel overnight to condition. The amount of wetting varies with materials from a few seconds for arum lilies to a couple of days for grapevine or Willow. To ensure a supply of suitable materials they need to be collected, dried and stored. Discard any damaged. Dirty or mouldy leaves. They can be spread out on a clean, dry surface in a shady area with plenty of air movement... Turn the heap of leaves frequently to allow them to dry evenly. When dry tie in bundles or secure with rubber bands. Or you can hang them in a dry shed preferably well ventilated and dark. Each bundle should be protected from dust, and moisture. This can be done by wrapping in newspaper securing with tape and labled . Small leaves like corn leaves and philodendron leaf bracts can be stored in cardboard boxes. Store in a dry place.A cupboard is ideal. CHECK your material regularly to make sure that they are still in good condition. Discard damaged leaves. LOMANDRA AND OTHER NATIVE GRASSES. IRISES and other strappy leaves as they are faster to dry without so much danger of them going mouldy. VINES and CREEPERS —WISTERIA is wonderful. Coil to desired size to store. CANNAS and GINGER — strip individual leaves, bundle and hang to dry. SWEET CORN LEAVES — try your local greengrocer. PHILODENDRON LEAF BRACTS — they have a rich red brown and feel like leather when dampened. NZ FLAX — remove the centre rib from each leaf and coil them by rolling with the shiny side into the centre so that they don’t shrivel into a tight cylinder. FINE NATIVE GRASSES, REEDS) RUSHES, CAREX. CORDYLINE — pull dry leaves from the plant before they become tattered. In September/October collect the JACARANDA leaf stalks as they fail.